This change in law enforcement services for St. Louis County Mo. occurred on July 1st, 1955. 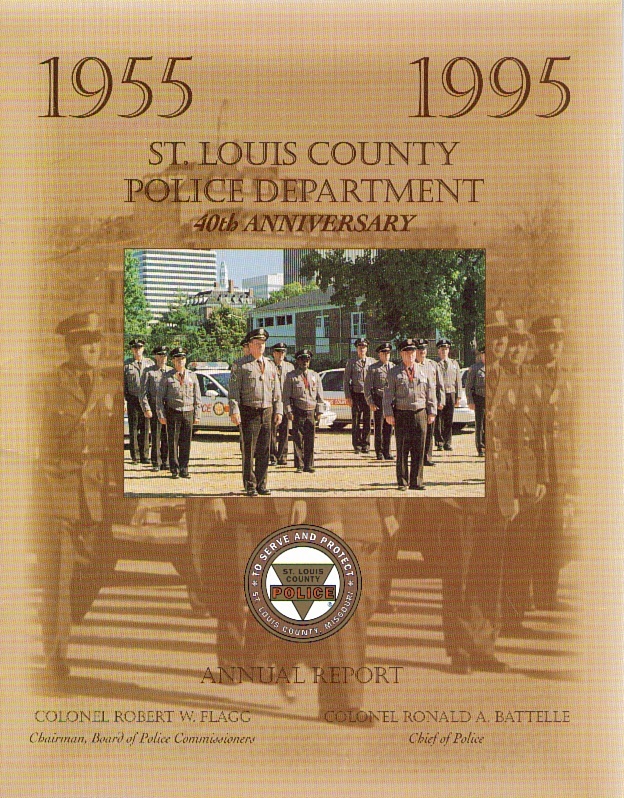 Due to problems within the Sheriff's Department, the St. Louis County Charter was amended by the voters in 1954 to restrict the duties of the St. Louis County Sheriff's Office. With the Charter amendment, all law enforcement services were assigned to a new police agency, the St. Louis County Police Department. The department is primarily responsible for law enforcement and investigations within unincorporated St. Louis County and contract municipalities, however, it has full police authority throughout the county, including its 91 municipalities. 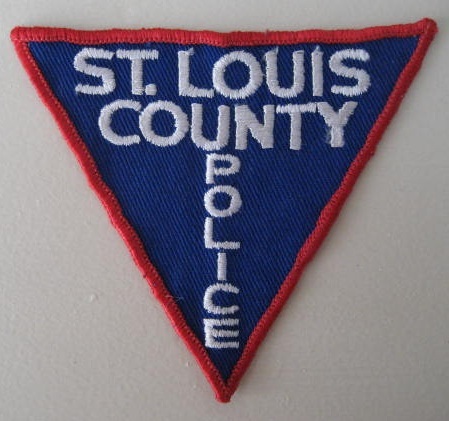 The St. Louis County Police Department is the primary and largest law enforcement agency serving St. Louis County Missouri. The current police chief is Colonel Jon Belmar. 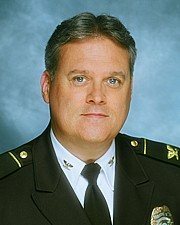 According to the Charter of St. Louis County, the county police chief has all of the duties of the sheriff of St. Louis County, except for the operation of the St. Louis County Jail, which is handled by the St. Louis County Department of Justice Services (civilian), court bailiff and service of civil process. Court bailiff/civil process duties are provided by a court-appointed sheriff and his employees, none of whom have law enforcement powers. C F" Bud" Spaethe Jr. This organization was created in 1957. The original members consisted of a small group of professional and business leaders in the community which was brought together with the supervisory and command officers of the County Police. The objectives were to establish a relation between the police and the community, and secondly to enlist support for the newly department to obtain needed materials and equipment. 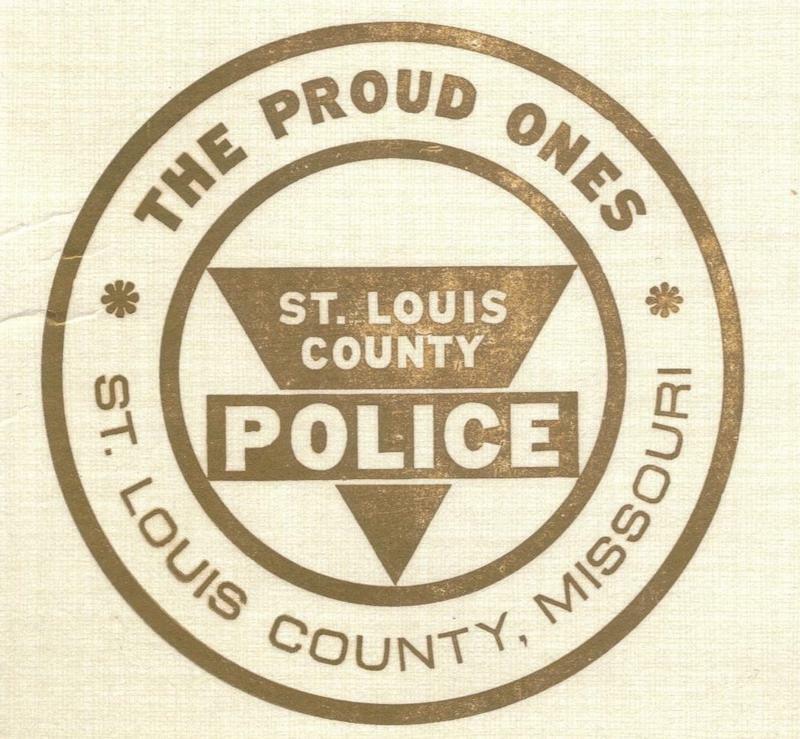 In 1979 the command staff, and at that time, Chief Kleinknecht decided that after 22 years the St. Louis County Police would no longer retain official support for the CO/AO. Breast and hat badge # 1 was issued July 1st, 1955 to Bird W. Sappington DSN 130. 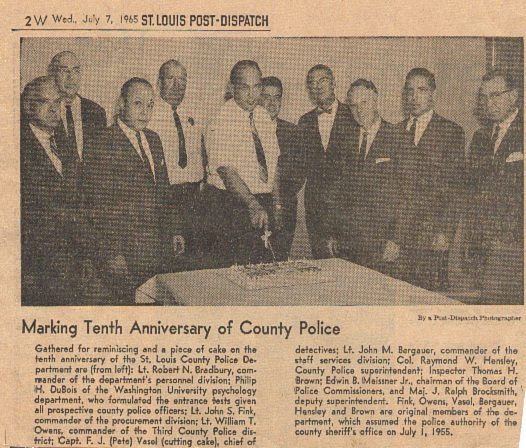 In 1969 upon Birds retirement, the County Police Department officially retired badge # 1.